NAPA AUTO PARTS CHEVROLET: This weekend at Talladega Superspeedway, the familiar blue, white and yellow NAPA AUTO PARTS paint scheme will grace the No. 9 Chevrolet Camaro ZL1. 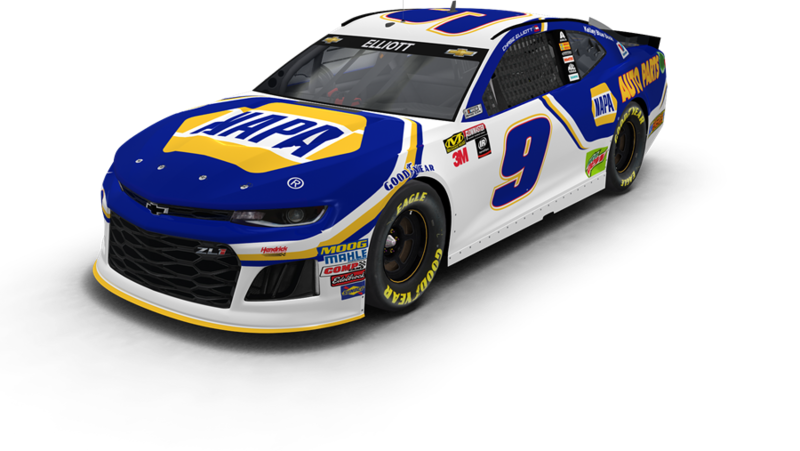 The Atlanta-based company will serve as majority sponsor for Chase Elliott and the No. 9 team for 26 NASCAR Cup Series races this year. TALLADEGA STATS: Elliott will make his fifth start at Talladega Superspeedway this weekend. The 22-year-old driver earned the pole award in his first start at the track in May 2016 and garnered a top-five finish. Elliott has led 62 laps and averages a starting position of 3.8 and finishing position of 15.8 at the track. In his most recent visit to the track in October 2017, Elliott led three different times for a total of 26 laps and ultimately took home a 16th-place finish after he was collected in a multiple-car incident while trying to take the lead in the final 10 laps. The Dawsonville, Georgia, native also has three starts at Talladega in the NASCAR Xfinity Series, collecting one top-10 finish. RICHMOND REWIND: Elliott started on the outside pole for the NASCAR Cup Series race at Richmond Raceway and ran inside the top five for much of Stage 1 until tire fall-off saw him begin to slip back a few spots. 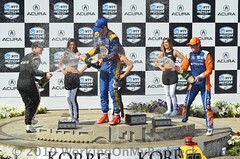 Elliott managed to maintain a top-10 position, finishing the first stage in seventh. The 22-year-old driver continued to race inside the top 10 for the majority of the second stage as well until he radioed to his team that he was battling the handling of the No. 9 NAPA Brakes Chevrolet Camaro ZL1, reporting he might have used up the tires too quickly. Elliott fell to 15th before the green-checkered flag waved at the end of Stage 2. 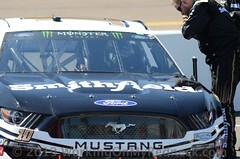 He began the final segment in ninth and continued to push inside the top 10 for the remainder of the race. With the help of a few great restarts by Elliott and quick stops by the NAPA Brakes pit crew, the No. 9 team collected a runner-up finish when the checkered flag waved. The finish marks the eighth runner-up result of Elliott’s career – the same number his father, Bill Elliott, amassed before capturing his first NASCAR Cup Series win. GUSTAFSON AT RESTRICTOR-PLATE TRACKS: Crew chief Alan Gustafson will call his 54th Cup Series race from atop the pit box at a restrictor-plate track this weekend at Talladega. In his previous 53 races calling the shots for five different drivers at Talladega and Daytona International Speedway, he collected eight top-five results – three of which were runner-up finishes – nine top-10s, 384 laps led and nine pole awards. GET YOUR VOTES IN: The All-Star Race at Charlotte Motor Speedway is quickly approaching and Elliott is among 20 drivers who are not yet locked into the event. In both 2016 and 2017, Elliott was voted into the All-Star field by the fans. This year, fans have the same opportunity to get their favorite driver into the ranks to compete for a chance to win the $1 million All-Star Race purse by voting once a day at www.nascar.com/fanvote. Votes shared via Facebook or Twitter will count double toward a driver’s total. Voting is now open and will close at 11:59 p.m. ET on Friday, May 18. CHARLOTTE RACE WEEKEND SWEEPSTAKES: With the help of Hooters, Elliott has put together an amazing Memorial Day race weekend VIP experience like no other. For as little as a $10 donation to the Chase Elliott Foundation, fans will be entered to win a grand prize trip for two to Charlotte, North Carolina, to meet the driver of the No. 9 Chevrolet Camaro ZL1 and attend not only the NASCAR Cup Series race at Charlotte Motor Speedway (Sunday, May 27), but also the 22nd Annual Hooters International Pageant the night before the race. Airfare, hotel, VIP tickets to the Hooters Pageant and garage/pit passes are all included. The more you donate, the more chances you have to win the grand prize trip. When you make a donation, you can also receive special rewards like exclusive T-shirts, signed hero cards and die-casts, and even garage/pit passes to your favorite NASCAR race. Click here for more information or to make a donation. ELLIOTT AT CHEVY STAGE: On Sunday, April 29, Elliott will appear at the Team Chevy Stage in the fan zone at 10:30 a.m. local time for a question-and-answer session. RICHMOND RECAP: William Byron narrowly missed the top 10 at Richmond Raceway last Saturday night with a 12th-place result, but had what may have been his best race in the NASCAR Cup Series to date. 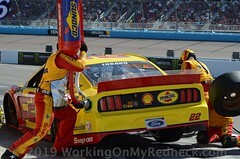 The Cup rookie ran in the top five for much of the evening, earning valuable points in the first two stages, and moved up three positions – from 19th to 16th – in the season standings. 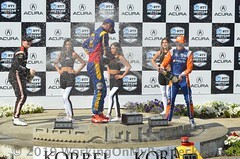 He was also the top-finishing rookie in the race, further increasing his lead in the rookie of the year standings. Byron is quickly progressing in his rookie year, running in the top 10 in seven of the nine races in 2018, spending 135 laps inside the top 10 through the first six races and adding another 451 laps to that total in his most recent three races. He has run in the top five in six of the last seven races and experienced a similar improvement with 29 laps in the top five through the first six races and 104 laps in the top five in the most recent three events. 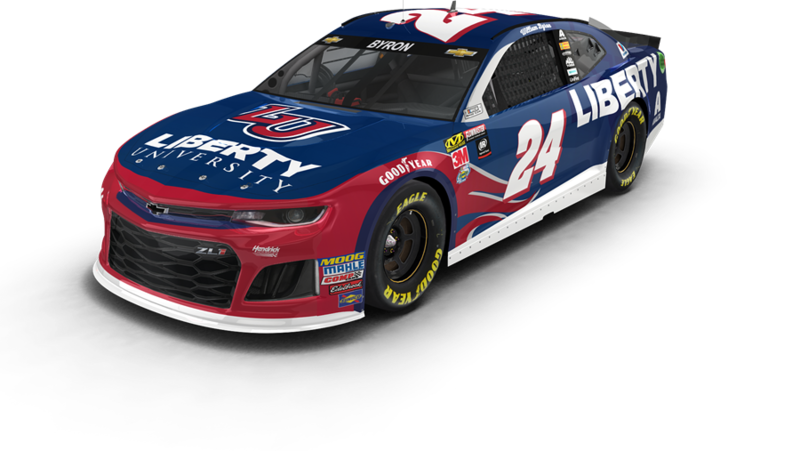 LIBERTY RETURNS: The blue and red Liberty University colors will adorn the No. 24 Chevrolet Camaro ZL1 this weekend at Talladega Superspeedway for the university’s fourth race of the season. Liberty is the majority primary partner of the No. 24 team with 12 races in 2018. Liberty University, founded in 1971, offers more than 550 unique programs of study from the certificate to the doctoral level. Byron, a sophomore majoring in business communications, takes online classes at Liberty, which offers more than 250 programs online. He recently took to Twitter to show how we was still trying to keep up with his Monday schoolwork routine by staying up late to get it done after the Martinsville race was pushed to Monday by inclement weather. TALLADEGA STATS: In two NASCAR national series starts at Talladega Superspeedway – one in the Xfinity Series and one in the Camping World Truck Series – Byron’s best finish was 10th, which came in his first start at the track in the NCWTS. In this season’s first superspeedway race – the Daytona 500, which also marked his first NASCAR Cup Series start – Byron qualified fifth. He was involved in two multiple-car incidents and while he lost multiple laps due to the damage his No. 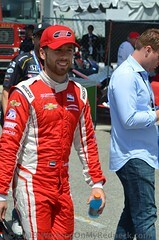 24 Chevrolet incurred, Byron still managed to complete the race with a 23rd-place result. In the No. 24 Chevy, Jeff Gordon earned 12 victories at restrictor-plate tracks, the most of any driver all-time and the most for any car number all-time, and six of those came at Talladega. Of 11 drivers who earned their first win at the 2.66-mile oval, two of them – Ken Schrader and Brian Vickers – were Hendrick Motorsports drivers, so it’s certainly not out of the question that Byron could earn his first win this weekend. EXPERIENCE ON THE BOX: While Byron may be a rookie, No. 24 team crew chief Darian Grubb is no stranger to restrictor-plate success. He’s earned three wins on the track type, leading three different drivers to Victory Lane. JG VIP EXPERIENCE: Byron will participate in the 2018 Jeff Gordon #24Ever VIP Experience again this weekend. The experience gives fans the opportunity to meet two drivers of the No. 24 Chevrolet – Byron and Gordon – and includes a meet-and-greet, an autograph, and a photo, along with a behind-the-scenes garage tour and an exclusive gift. The experience is available at four future races including Kansas Speedway and Charlotte Motor Speedway. Spots are extremely limited and this is the final year the package will be available. Visit www.jeffgordonvip.com for more information or to purchase a spot. TRACK Q&A: Byron will have another Q&A session on Sunday at 10:35 a.m. local time, this time as part of Talladega’s pre-race fan activities. The session will take place on the frontstretch at the start/finish line and is open to fans with a pre-race pit pass upgrade. Click here for more information. SOLID TOP-10 FINISH: Jimmie Johnson’s night at Richmond Raceway showcased another top-10 for the No. 48 team. Johnson started 17th but tagged the wall in Turn 2 on Lap 18, causing some damage to the No. 48 Lowe’s for Pros Chevrolet Camaro ZL1. He fell a lap down to the leaders but worked his way back onto the lead lap during the final stage. In the closing laps of the 300-mile event, the seven-time NASCAR Cup Series champion powered from ninth to sixth on the final restart. It was his third top-10 of the season, propelling the No. 48 team from 17th to 15th in the point standings. PLATE WINS: Johnson is sixth on the all-time list for most wins on restrictor-plate tracks, with former teammate Jeff Gordon leading the group with 12 wins. Johnson has five wins on plate tracks – two at Talladega Superspeedway and three at Daytona International Speedway. TALLADEGA FINISHES: The last win Johnson recorded at Talladega was on April 17, 2011. His best finish of late was a runner-up result behind former teammate Dale Earnhardt Jr. on May 2, 2015. It was during that race that the Hendrick Motorsports duo led a combined 117 of the 188 laps – Earnhardt led 67 and Johnson 50. SO CLOSE: Johnson’s 0.002-second Talladega victory in 2011 over competitor Clint Bowyer remains tied for the closest finish in NASCAR history since the integration of electronic scoring. ON THE UPSWING: Although there have been 32 races since Johnson has recorded a win, his 2018 season is on the upswing. Johnson finished in the top 10 in three of the last five races, including each of the last two. If Johnson were to capture a third consecutive top-10 finish this weekend, it would be his longest streak since the fall of 2016 when he earned four straight top-10s en route to his seventh NASCAR Cup Series championship. Alex Bowman will be available to members of the media on Friday, April 27, at 10:45 a.m. local time at the Talladega Superspeedway media center. SPEEDWAY RACING: Heading into the second speedway race of the 2018 season, the No. 88 Nationwide team already has a pole at Daytona International Speedway under its belt. Alex Bowman ran inside the top 10 for the majority of the Daytona 500 and led 13 laps en route to a 17th-place finish after getting caught up in an incident with just two laps remaining. 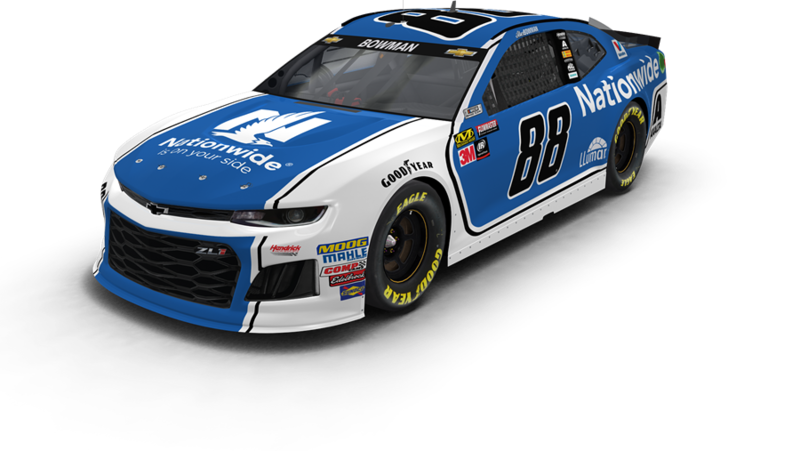 NATIONWIDE IS ON OUR SIDE: The Nationwide colors will be back on board the No. 88 Camaro ZL1 this weekend at Talladega Superspeedway. Nationwide has been the primary partner on the No. 88 Chevrolet three times at the 2.66-mile superspeedway, capturing the win in 2015 with Dale Earnhardt Jr.
IVES AT TALLADEGA: Crew chief Greg Ives has called the shots six times for the No. 88 team at the Alabama track with drivers Earnhardt and Bowman. The crew chief’s résumé at the track in the NASCAR Cup Series includes one win in 2015 with Earnhardt, two top-five finishes and three top-10s. The Bark River, Michigan, native has two starts as a crew chief in the NASCAR Xfinity Series at the track, where he captured the win in 2013 with driver Regan Smith. While a race engineer with the No. 48 team from 2006-12, Ives earned two wins at the track. SECOND TIME IN THE NO. 88: Bowman was behind the wheel of the No. 88 Chevrolet at Talladega Superspeedway in 2016 as a fill-in driver for Earnhardt. The driver of the No. 88 machine has a total of five starts at the track, with his best finish of 16th coming back in 2015. The Tucson, Arizona, native has one start in the Xfinity Series, where he finished 13th in 2013. HAPPY 25TH: The driver of the No. 88 Nationwide Camaro ZL1 is celebrating a birthday this week before heading to Talladega this weekend. Bowman will turn 25 on Wednesday, April 25th. GOODYEAR TIRE TEST: The No. 88 Nationwide team is participating in a Goodyear tire test at Michigan International Speedway on April 24 and 25. Bowman will be available to the media Wednesday, April 25, at 12:10 p.m. local time in the Michigan media center. VOTING IS OPEN: In just over two weeks, the NASCAR Cup Series will race under the lights at Charlotte Motor Speedway for the 2018 All-Star Race. In order to join the main event, Bowman – who is not yet eligible – must win a stage in the Open qualifying race or he can be voted in by the fans. From now until May 18, fans can vote once per day here for Bowman to join the All-Star Race. The fan vote winner will be announced on race day on May 19. NATIONWIDE’S PAWS AND RACING PROMOTION: This week marks the final week for pet owners to submit photos of their pets to the Paws and Racing promotion. For the second year, Nationwide is offering one lucky pet owner an opportunity to get his or her pet’s picture on the No. 88 Nationwide Camaro ZL1 for the Sept. 22 race in Richmond. Last year, more than 25,000 pet owners participated in the promotion. From now until April 30, pet owners and NASCAR fans can go to www.pawsandracing.com to submit a photo of their pet. At the end of the promotion, one lucky photo will be selected to win a VIP race experience including hot passes, race tickets and a meet-and-greet with Bowman and Earnhardt. HENDRICK MOTORSPORTS AT TALLADEGA: At Talladega Superspeedway, Hendrick Motorsports has 12 wins, 12 pole positions, 55 top-five finishes and 82 top-10s. Hendrick Motorsports’ most recent Talladega win came in 2015 when Dale Earnhardt Jr. made his way to Victory Lane in the May race after qualifying fourth. PLATE PROWESS: Hendrick Motorsports leads the way for teams all-time on plate tracks with wins (24), poles (30), top-five finishes (103), top-10s (167) and laps led (4,524). The organization’s drivers have swept the top-two finishing positions nine times on plate tracks, including four times at Talladega – both the most all-time. SPREADING THE WINS AROUND: Six different Hendrick Motorsports drivers have contributed to the organization’s 12 wins at Talladega Superspeedway – Jeff Gordon (six), Jimmie Johnson (two), Brian Vickers, Earnhardt, Ken Schrader and Terry Labonte. That’s the most all-time, ahead of Ranier Racing’s five different drivers to find Victory Lane at the 2.66-mile oval. FRONT-RUNNERS: The organization has won nine of the last 12 plate race poles in which qualifying was held, including the last three. 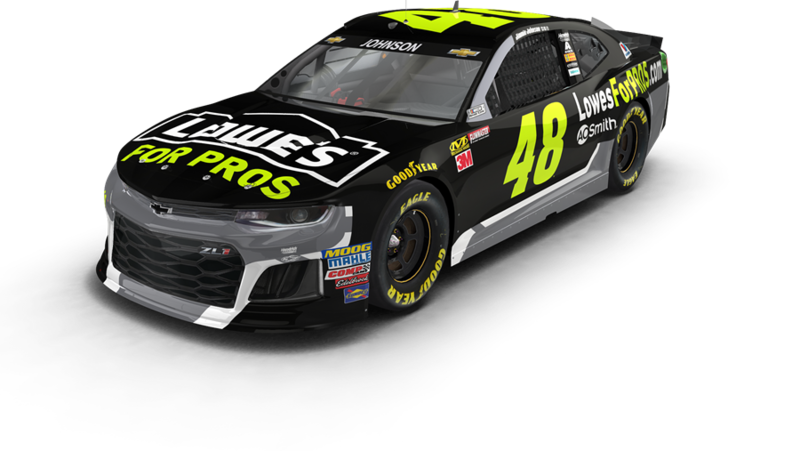 Hendrick Motorsports owns the streak of most consecutive front-row starts on plate tracks with seven from 2014-2016, five from 1988-1989, again in 2009-2010 and currently from 2017-2018. 250 ON THE HORIZON: The next points-paying win by a Hendrick Motorsports Chevrolet will be the organization’s milestone 250th in NASCAR Cup Series competition. With 268 Cup victories, only Petty Enterprises has more. Junior Johnson and Associates is third all-time at 153 wins, followed by Joe Gibbs Racing with 151 and Roush Fenway Racing with 137. 16 MAKES 249: Sixteen different drivers have contributed to Hendrick Motorsports’ total of 249 points-paying Cup wins. Only the Wood Brothers team, which has sent 19 different drivers to Victory Lane, has more. Junior Johnson and Associates won with 13 different drivers. FIRST-TIME WINNERS: If Chase Elliott, William Byron or Alex Bowman wins at Talladega, it will mark the ninth time a driver has recorded his first career Cup Series win while driving for Hendrick Motorsports. Hendrick Motorsports and Roush Fenway Racing share the all-time record, having each sent eight first-time winners to Victory Lane in Cup Series competition. ORGANIZATION STATS: To date, Hendrick Motorsports has totals of 12 championships, 249 race victories, 214 pole positions, 1,033 top-five finishes and 1,750 top-10 finishes in points-paying NASCAR Cup Series competition. Its teams have led more than 67,000 laps since 1984.